See an ancient Hindu temple at Ulun Danu Bratan Temple. Built in 1663 on the shores of Lake Bratan with manmade islands stretching out into the lake, the water temple cuts a figure against the surrounding mountainous landscape and hallowed waters. Admire the delicate interiors of the temple buildings, and place an offering to the Balinese water, lake, and river goddess Dewi Danu, who is particularly esteemed here because of the importance of Lake Bratan as a source of irrigation in the area. Before you leave, take time to appreciate the fertility and natural abundance of the area by having a freshly cooked local meal at the on-site restaurant. Put Ulun Danu Bratan Temple and other Tabanan attractions into our Tabanan road trip planner, and watch your holiday take shape. One of the largest temples out of the water if not the most important Shiva and his consort, Parvathi on Bali island. The temple seems to float on the waters of Lake Beratan making it very impressive. Recommended step but to bind to other destinations on the way. Little info to those who organize the journey alone: at the entrance you can have lunch in a restaurant buffet not bad for a fixed amount of 115 ' 000 rupees. First of all I must say the place is beautiful. The ticket counter is the place where after you buy your tickets they provide their own scooter or vehicles to reach you to the temple. There itself you'll find people selling religious stuffs, please don't get swayed away. Followed by the beautiful staircase, a perfect place for photography you will also enjoy the view once you reach on the top. You could see the entire temple, the city and the sea. Please take a guide along with you when you explore the temple . This iconic temple is the most beautiful I've seen in Indonesia. Without a doubt the most photographed and advertised one and definitely worth visiting. It is well preserved and maintained and a real tourist attraction in that sense. We came here during an unknown ceremony (probably a funeral) and found the people surrounding the temple were most friendly, pointing us to the best spot for taking photos. Simply Stunning! Any trip to Bali would not be complete without visiting this magnificent place! I think it's better to visit in the morning or before 2.00 pm to have a clearer view. There are plenty of places inside the premises to take nice photos. It is a bit of a journey to see this temple, but it is well worth the trip. It is much cooler, since it is located in the more mountainous region of Bali. The grounds and gardens surrounding the temple are absolutely beautiful. I highly recommend if you’re visiting Bali. I would also suggest driving toward twin lakes to see all the monkeys if you have time, about 5 min from this temple. Every day, we help thousands of travelers plan great vacations. Here are some tips on how to use your Listing Page to attract more travelers to your business - Ulun Danu Bratan Temple. Promote your permanent link - https://www.inspirock.com/indonesia/tabanan/ulun-danu-bratan-temple-a816989687 - on your website, your blog, and social media. When a traveler builds a plan from this page, the itinerary automatically includes Ulun Danu Bratan Temple. This is a great way for travelers looking for a great vacation in your city or country to also experience Ulun Danu Bratan Temple. Promoting your link also lets your audience know that you are featured on a rapidly growing travel site. In addition, the more this page is used, the more we will promote Ulun Danu Bratan Temple to other Inspirock users. 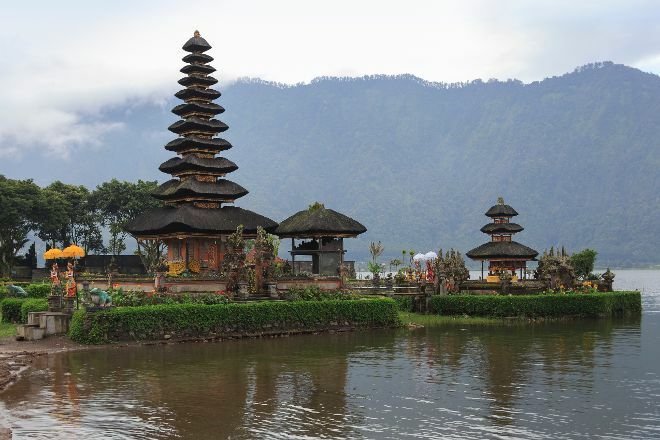 For best results, use the customized Trip Planning Widget for Ulun Danu Bratan Temple on your website. It has all the advantages mentioned above, plus users to your site can conveniently access it directly on your site. Visitors to your site will appreciate you offering them help with planning their vacation. Setting this up takes just a few minutes - Click here for instructions.